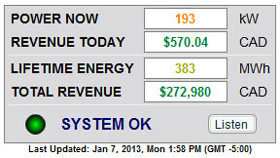 A utility meter will provide a monthly report of total energy generated. However, unless you regularly read the meter and manually plot the output, it will be difficult to determine how well the system is working. If a problem occurs, the first indication of lost revenue may be a low utility payment months later. By communicating over the internet through your computer or mobile device, you will always know how your system is performing. Check actual output at any time. On a day of full sun, the system should reach maximum capacity. Use the peak recorder, standard on all systems, to determine if the expected output was reached. For more detailed performance calculations, add the optional WeatherTrak™ power/irradiance plotter. A visual indicator alerts you of an alarm condition needing your attention. Use the ANALYZER tools to get more information for fixing the cause. 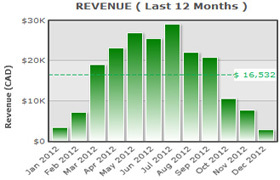 Receive an email of your daily, weekly and lifetime revenues each evening. 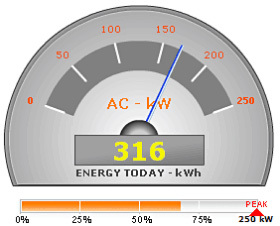 Visit the energy portal any time for detailed analysis of performance. Create reports from screen captures or download data into a spreadsheet for more detailed analysis. 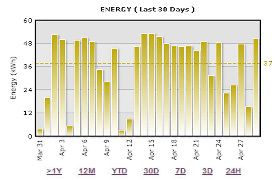 Select energy graphs for different time periods to evaluate daily and seasonal variation. Spot conditions needing attention like low output in winter that could indicate snow coverage. 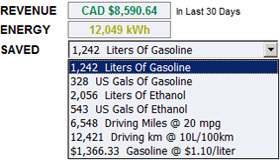 Learn about the savings of common fossil fuel equivalents your system is achieving by converting solar energy to grid electricity. Select any time period to get an appreciation of the sustainable impact you are making.